Feel like changing jobs? Before submitting your notice, check on the internet to see what sort of interest there is in your profession, and how much the market is willing to pay. Sometimes all you need to do is submit your CV, and the job will find you. Here you can register, state your requirements, and sometimes even take language or professional tests online. Companies in search of candidates regularly peruse the offers, and if your CV catches their eye, they will contact you by phone or via a message box on the relevant page. CVs on display contain no personal information, everything is done anonymously. It is recommended that you enter your CV with several sites simultaneously, but first read advice from HR experts on how to structure your CV properly, how to prepare for interviews, and so on. Available jobs fall under Computer Press, which means IT vacancies also appear on the web sites of specialized magazines such as Computer or Mobility, or the web sites Zive.cz, Uzdroje.cz, etc. Additionally, the volna-mista site is pleasantly fast, as it contains no banner advertising. Like its largest competitor, jobs.cz, this site focuses on the ranks of graduates, whose CVs are stored separately and properly emphasized. This is a reflection of the number of multinational companies that seek out young, dynamic people whom they intend to train themselves. One of the newest e-recruitment entities, this site focuses on all types of positions in all business sectors. If the TOP offers window does not interest a job seeker, he or she can browse through individual advertisements or search according to the his/her own criteria. On average, the site lists 2,000 vacancies, and all of the offers are exclusive. CVs can be entered for free into a pre-defined form, and one can peruse the opinions and advice of HR experts. This web site contains about 50,000 advertisements, which are deleted after four weeks or sooner. This high number is due to Jobpilot’s listing the entire contents of, or making partial contributions from, several dozen additional subjects, including sites such as Sezman, Atlas, and others. At www.jobpilot.cz/content/service/infopoint/salary_test.html, you can find out how workers in similar professions are paid elsewhere. This personnel site also contains the popular address www.horkezidle.cz, on which a list of still “hot” vacancies that have just opened up appears. 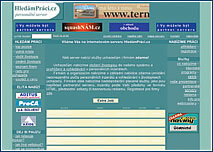 The oldest Czech server combines three types of services for different target groups. The main search engine, www.prace.cz, is intended to be a universal medium with the highest number of visitors and links. Next to it exists hotjobs.cz, with a range of the most recent information, and finally jobs.cz, with the motto “connection with the elite”, referring to multinational organizations. You can get to their up-to-date offer of jobs one click from the home page. Since 1996 more than 7,000 firms cooperated with this server, which boasts around 6,000 positions listed. If you receive notice as per paragraph such and such, and you don’t know what it means, look under the search register of key words on the Ministry of Labor and Social Affairs web site. In the “Work and salaries” subcategory all laws dealing with these issues are published. Similar information can also be found on the www.epravo.cz Web site. This site, owned by Merlot d’Or in Pilsen is like a miniature encyclopedia of wine. It gives advice on tasting wine, which types and vintages to buy, and, finally, how wine should be stored. You can order free monthly E-wine news bulletins, which contain articles translated from the specialized press in France. An internet directory that contains 3,827 products made by 957 companies plus as a bonus 255 specialized articles for laymen. There is an “inspiromat nápadů” (inspiring ideas) link, where do-it-yourselfers share their creations. Also of interest are the prices of the goods sold over the internet. Durable goods and household appliances can also be bought via the www.electrohall.cz site. – This involves offers that bombard e-mail addresses without the addressee ever requesting them. They are mainly commercial in nature, but they can also involve chain letters, viruses, and many types of ideological rants. Such messages are similar to the printed leaflets claiming to make advantageous offers that jam up mail boxes. Electronic spam is more abundant, as it costs the sender nothing, and defending against it is more difficult. Most e-clients use filters that can be set to one’s own level of filtration. However, not all words can be blocked, so the only solution is to delete unsolicited e-mails and be glad that spam abuse has barely targeted SMS messages.